A pool provides a great source of recreation and fun for the whole family, especially during the blistering hot summer months where to sunny weather tempts you to come outside but the high temperatures make it difficult to tolerate the outdoors for more than a few minutes at a time. Like the pool itself, the pool deck can be a great place to relax and enjoy beautiful weather. Set up a few lounge chairs and umbrellas and you have the perfect place to rest or dry off between laps in the pool. 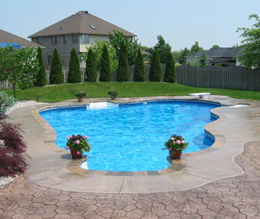 Your pool deck can complement the look of your pool and enhance the appearance of your backyard. 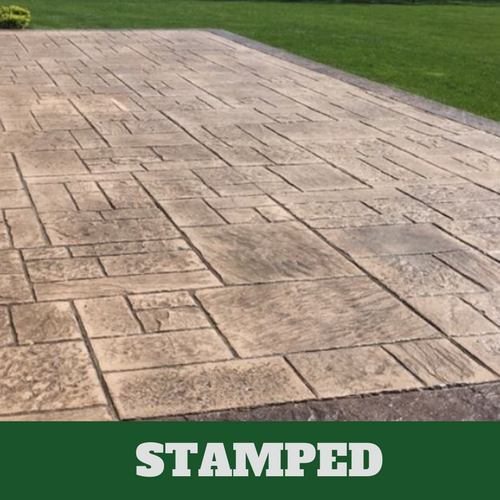 When you choose Danbury Stamped Concrete, you will have endless customization options available to you to make your pool area everything you've ever dreamed of. 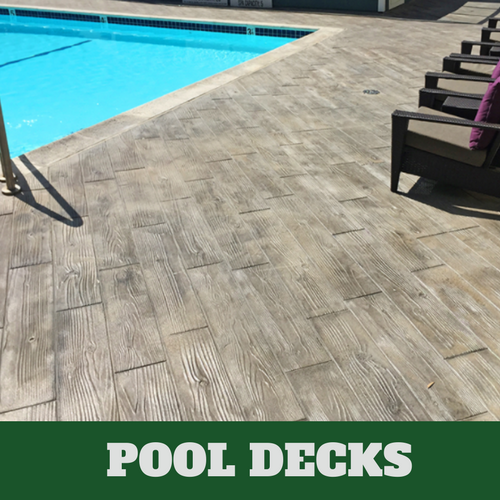 A pool deck is not just decorative. It's important to keep in mind practical considerations such as the amount of maintenance required as well as safety. 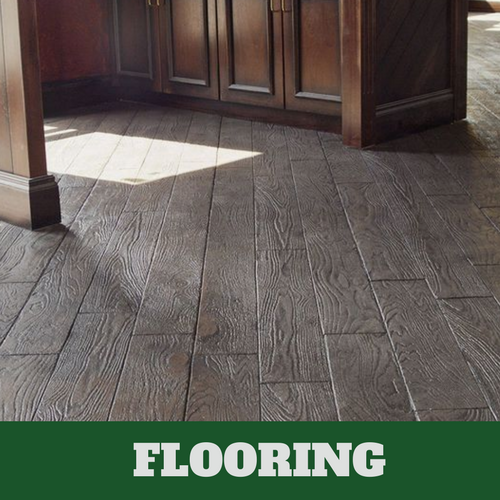 Tiled surfaces can be difficult to fully clean, which may lead to bacteria, mold, and mildew. 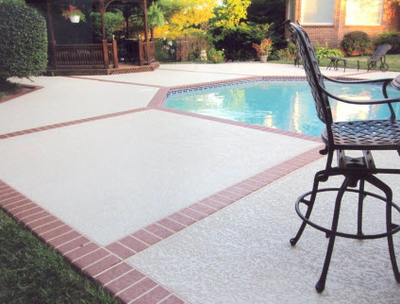 Certain materials may become slippery when wet, which can be a safety concern for many homeowners with children who may occasionally forget the rules and run around the pool area. 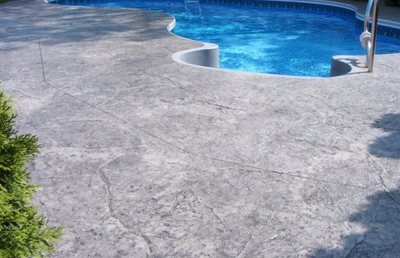 For these reasons, concrete makes an ideal material for any pool deck regardless of budget. It is easy to hose down and keep clean, and it provides enough traction even when wet to reduce the risk of accidents around the pool area. 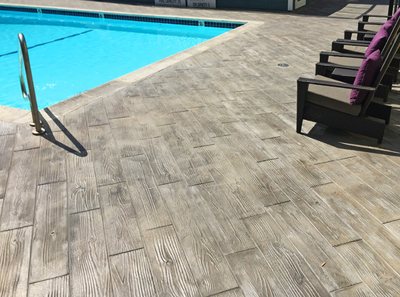 Our concrete company provides professional concrete pool deck installations for homeowners in Danbury, CT and the surrounding areas. 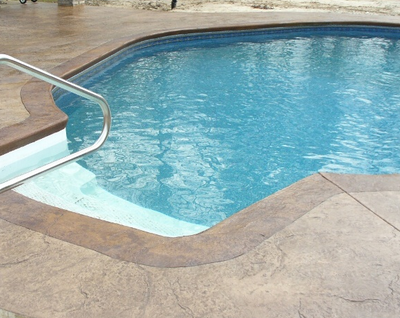 Maintaining the cleanliness and condition of a concrete pool deck is relatively easy and affordable. 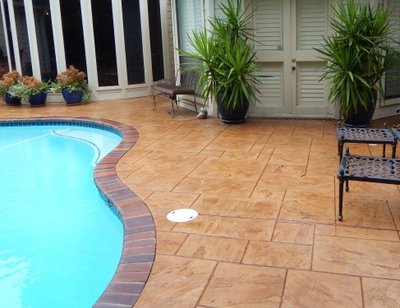 For this reason, it is a popular choice for residential and commercial pool decks alike. 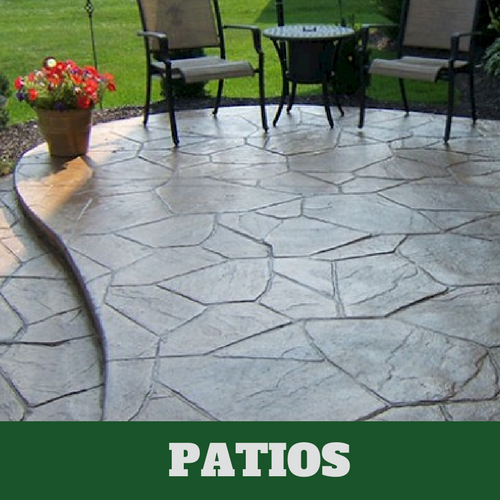 However, from time to time, clients require concrete crack repair or other concrete services to help keep their pool decks looking like new. That's where we come in! 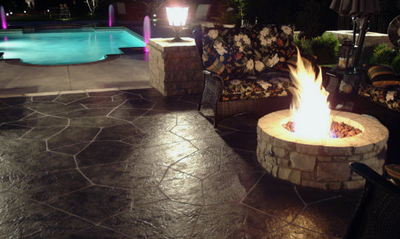 We offer affordable concrete repairs and installation to help you keep your home and property looking spectacular! The same old plain concrete pool deck is not for everyone. 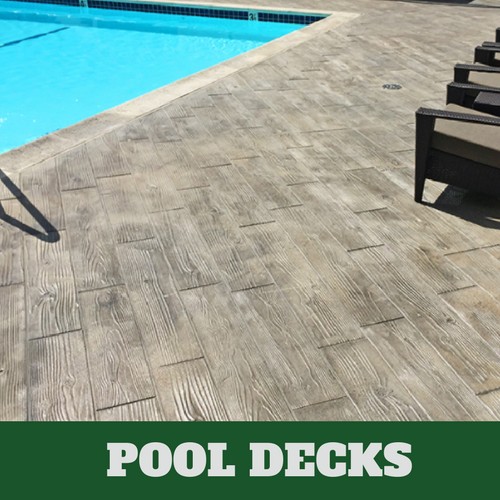 While some enjoy the sleek and modern look of smooth concrete, others do not necessarily enjoy the look of a boring, grey pool deck. 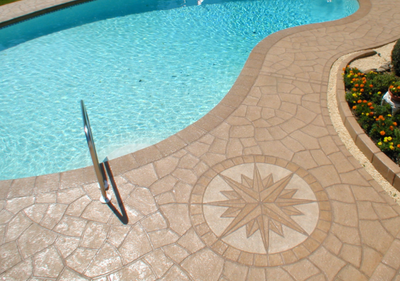 We offer concrete stamping and concrete staining to help bring a more unique style to your pool area. Mimic the look of a more expensive material or create a fun custom pool deck area that represents your family and personal style. 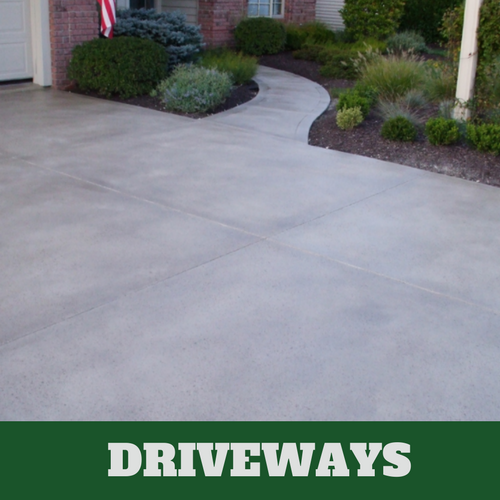 The options are virtually endless thanks to the skill and craftsmanship of our cement contractors. 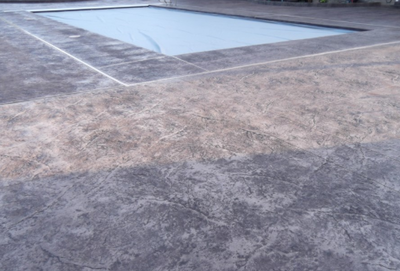 For the best concrete pool deck, you need Danbury Stamped Concrete. 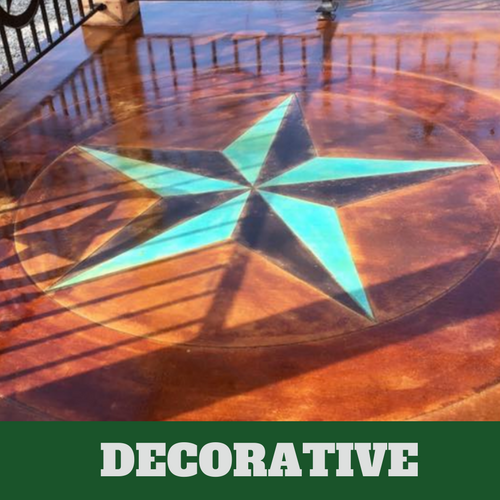 Whether you are looking for something basic or an entirely custom design, we will be happy to take on your project and make your dreams a reality. Our team has the skills, experience, and knowledge to execute any design, as well as the careful attention to detail and aesthetic sense you would expect from artists and craftsmen.